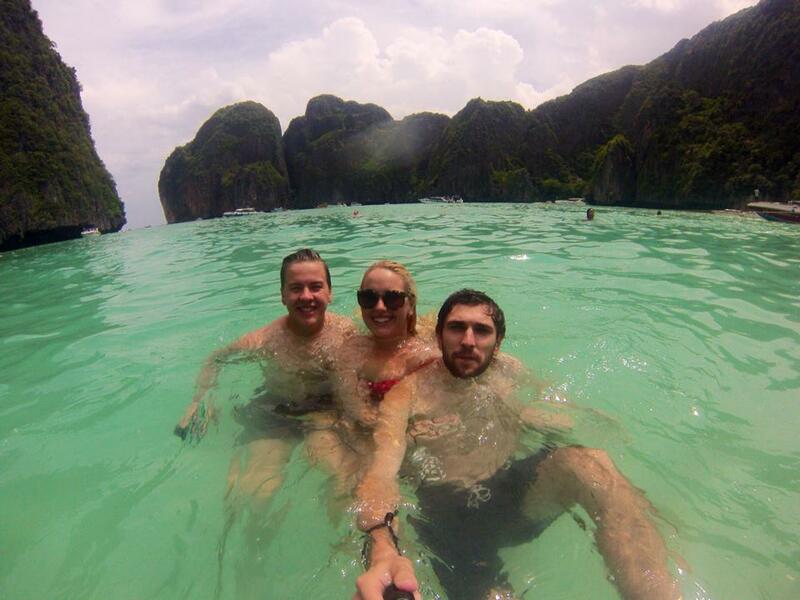 Phi Phi Island, Thailand… Is It Over-Rated?? After a long and dramatic transit from Japan we finally arrived in Phuket, Thailand – five hours later than originally scheduled. We went through customs, got our visa stamped (it’s free for Australians and Pom’s) and after collecting our bags made our way out through the exit, with shouts of ‘Taxi?’ ‘Hotel?’ ‘Taxi?’ being yelled at us from every which way (expected in any Asian country). We made our way to the information desk at the end of the gate for directions to our accommodation and to get cash out at the ATM. It cost 180 baht and 45 minutes in the shuttle bus to our hotel, with a ‘mandatory’ stop at a business to ‘check addresses’ (which really means to try and sell you tours at an elevated rate). We found our hotel via Hostelworld. ‘The Marq’ hotel, which was by no means The Hilton but adequate enough for poor backpackers, is a ten minute walk to the market district and fifteen minutes to the beach. In a place that’s overpopulated with tourists and therefore an expensive place to visit we got a real deal for $6 a night- clean, air conditioned rooms fitted with king size beds, plasma TVs and a private bathroom, with friendly and helpful staff to match. It was just what we needed to freshen up and rest after the last 24 hours. We waited for my brother to arrive in Phuket (he had to fly the next day due to a triple price increase on flights), grabbed dinner and went on our way to haggle deals for our intended sightseeing. I quickly realised that Thailand was going to be much more expensive than I originally thought, definitely much more than other developing countries I’ve previously visited. I’m a good barterer and always get what I want at the price I’m after (ask anyone who’s traveled with me, i’m the fiercest bargainer around), but Thai people (or more specifically Patong people) are much tougher, it’s hard to get them to budge much from their asking price. The best deal we could get was 3100 Baht for all three tours: Phi Phi day trip, James Bond day trip and a night at the infamous Muay Thai. All up that’s about $100 Aud, which isn’t bad in theory but steeper than I was expecting. We got a late dinner and decided after a good sleep in (‘lie in’ for you pom’s) we’d spend the day catching up on our travel blogs and photos- a task that always gets behind. So at 7am we were picked up by our air-conditioned mini vans (did I mention it was hot? It’s a sweltering, sweat fest that averages 36 degrees Celsius morning and night) and driven for at least an hour to the pier to catch our boat. We could have gotten a cheaper deal and go on the large, slow boat option but I’d heard from many people that instead of spending time on the sights you instead spend hours packed on a large boat traveling from place to place. I’m really glad we instead chose the speed boat option, a much smaller boat (which they still managed to squish 30+ people on) where the breeze cools you down and the day doesn’t seem nearly as long or unbearable of an experience as I’d heard from so many others. 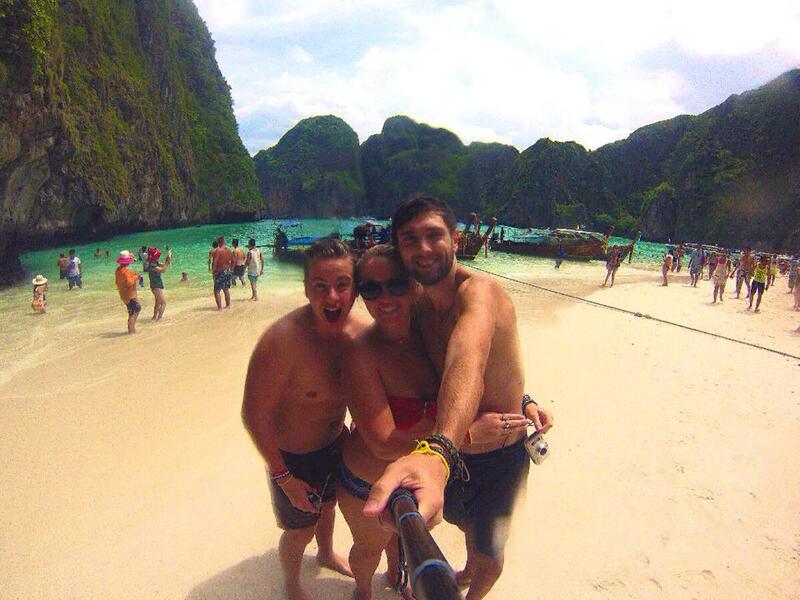 Our first stop was Maya Bay, infamous for being the location ‘The Beach’ was filmed. It was a really beautiful spot, soaring high karst cliffs enclosing the whitest of sands, the jungle backdrop and the bluest of waters. It would have been even prettier if said sand and water wasn’t swarming with thousands of people. It was a task and a half to find a spot empty enough to get those must have pictures. I’d heard from a lot of people that it wasn’t worth going to, that with the thousands of people and the long boat trip over it just wasn’t worth it. I’m really glad that we didn’t listen to those suggestions. Was it busy? Yes. Was it worth seeing? Absolutely. But definitely choose the speed boat option, our day really wasn’t anywhere near as torturous as everyone said it would be. In fact it was really enjoyable. It was then time to snorkel at Loh Samah Bay, which was teaming with life, so many beautiful fish swimming around us. After Maya Bay (part of Phi Phi Ley island, which is uninhabitable) we drove through beautiful Viking Cave and Pileh Lagoon and stopped to admire and feed the Monkeys at ‘Monkey Beach.’ We then stopped at Pho Phi Don Island (where if desired you can stay for a few days and attend an infamous full moon party) to enjoy a buffet lunch overlooking the picturesque beach below us. At one point Andy got into an argument with an old, bogan Australian man. We were snorkeling along when we noticed this man trying to break a piece of the coral off. Theirs nothing that makes me angrier than when I see people destroying the reefs. As an avid snorkeler I’ve seen so many people snorkel irresponsibly, the most common is when they step all over the coral with their huge flippers. I’ve snorkeled in the Great Barrier Reef numerous times over my lifetime and every time I visit the coral is smaller and duller in colour, which I blame in most part on the stupidity of tourists who destroy it with their carelessness, just like this man. But as an Aussie he really should have known better. We tapped him on his snorkel piece and signaled ‘no’ to him. I thought that was that and continued swimming. Next thing I hear a commotion and swim to the surface to see him pointing his finger aggressively at Andy and shouting, “If you f****ng touch me again mate I’ll bash you. Mind your f****ng business!’ I told him to calm down and that we were just telling him not to destroy the coral. We later heard him telling his family that we pushed him and that he was just gently stroking the coral, but we have all the proof on our trusty GoPro. Next up we stopped at Khai Nai Island, one of our favourite stops. It was a tiny island which had a few trees and nothing else separating the two sides of the island. 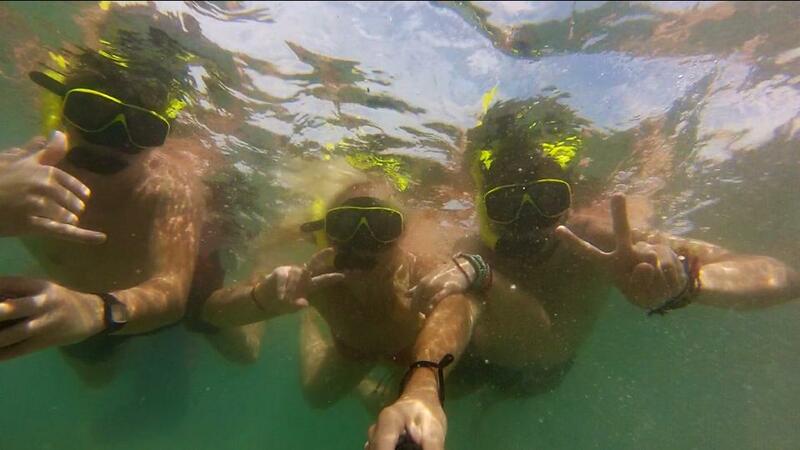 Their were a few pop up bars playing reggae music as we swam and snorkeled to our hearts content. If you swim quite far away from the crowds (still shallow), the fish and coral are much more colourful and active. It was then time to return to the buses and our hotels after a very eventful and beautiful day exploring one of Thailand’s most loved and visited spots. We did this through Mandala Travel. The tour includes roundtrip transfers by air conditioned mini vans, soft drinks, water, fruit, Buffet lunch, snorkel and mask. Lifejacket, English speaking guides, speedboat and full insurance were also included. They advertise this tour at 3,200 Baht per person, we paid 1100 Baht. We had no issues with this tour company but the service was by no means outstanding. My verdict? Visit Phi Phi / Maya Bay. If you have the time stay for a few days too! It may be over-populated with tourists but that’s only for one reason… It’s absolutely beautiful!! What do you think? Share your thoughts in the comments below! A full-time traveller since 2009 I have spent the last eight years exploring ALL seven continents of this beautiful world on a backpackers budget. I'm a little bit too obsessed with taking photos, trying new foods and all things Harry Potter. Is Railay Beach Thailand’s Best Kept Secret? What To See And Do In Bangkok, Thailand! Welcome to Seven Continents Sasha! I'm an Australian girl who has been travelling the world non-stop since 2009. I've explored over 60 countries (and counting) across ALL seven continents of this beautiful world.